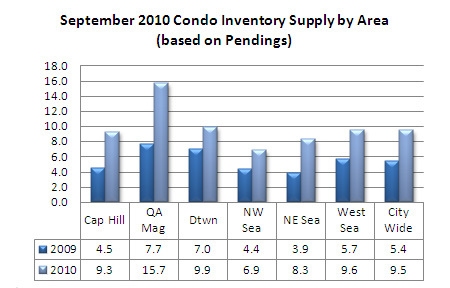 September’s NWMLS figures were a mixed bag for Seattle’s condo market. Overall, market values held their own, though sales plummeted. 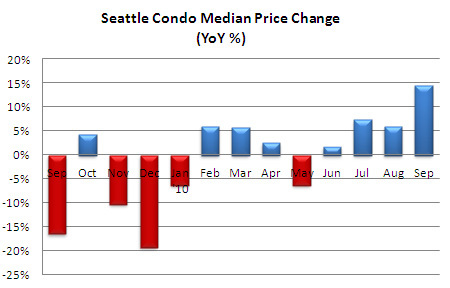 Seattle’s citywide median condo price remained unchanged from August at $297,000. However, that was a significant one year increase of 14.56% over last September. That last time we experienced a double-digit year-over-year median price increase was back in October 2007, just when the market started to crash. 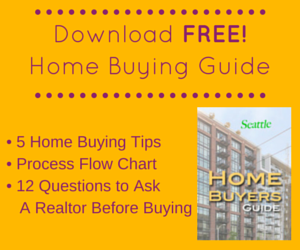 Keep in mind, results varies by neighborhood and price points. With the exception of the Downtown/Belltown and Capitol Hill areas, every neighborhood realized declining values. As we head into Fall the number of active listings will diminish, which we saw in September with a one-month reduction of 4.1%. Compared to last year, however, there were 5.8% more listings. Listed short sales and bank-owned properties (REO) accounted for 1 in every 5 condo units for sale. The most striking stat was the huge drop in the number of sales (pending transactions), down 40.2% from last September and a 19.8% one-month decline from August. The number of closed transactions dipped as well…down 23.8% year-over-year and 7.7% month-over-month. However, that was to be expected to some degree. 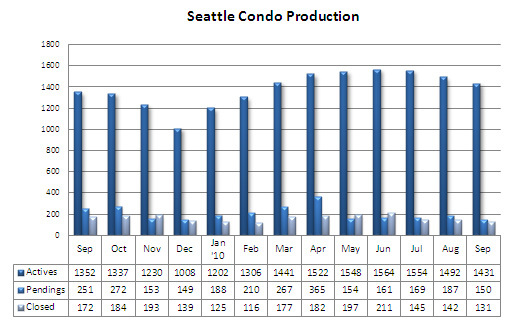 Condo sales last autumn were spurred by the original November 2009 tax credit deadline, which generated a rush of sales in September and October of last year. 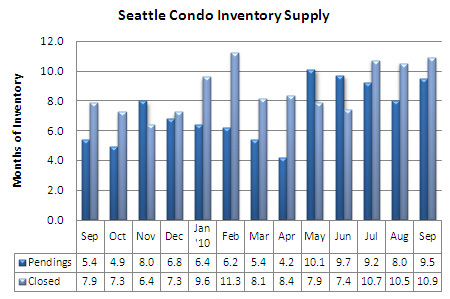 The higher number of sales last year kept the inventory supply rate low as well. 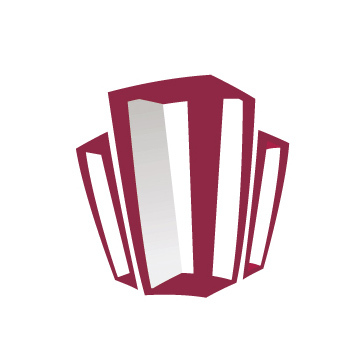 Without the tax credit incentive this year, along with economic uncertainly and buyer weariness, the inventory supply rate rose to 9.5 months, even though the number of listings have been declining since June. 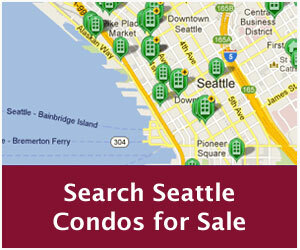 As a result, Seattle remains ensconced in a buyers market. Going forward, expect condo sales to slow its pace further, though I think we should see values hold their own (citywide median). I like reading other market stats to see how the market’s doing in places outside of Atlanta. Looks like year over year stats for September canceled out with last year’s (-15% to +15%). One of the most powerful charts I think is the closed/pending/active chart. I love using something similar on listing presentations for pricing it right the the first time around. 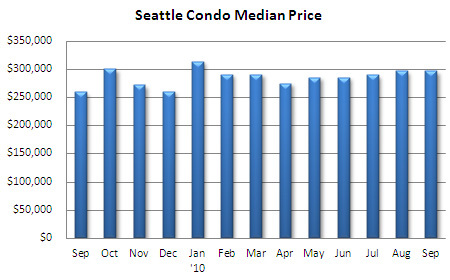 why do real estate people always focus on the median? it’s not the best metric and often misleading. b/c in downcycles people with money always have the money and can buy and that can usually mean that high end sales may outpace low end sales and skew the median and then paint a misleading picture. do you have the averages and can you report them? i live in belltown and the RE market is definitely stagnant and not moving, so i was surprised to see the comments above. People are still trying to price their units for $500/sq foot and I think they are smoking crack and pretending its overpriced 2006 or something. seriously! i think things will fall back to around $300/sq foot like they were in 2003…especially if history is any indicator. Belltown has numerous problems with noise and crime and new buildings are going to be blocking some older condo views – like at seattle heights where the corner lot on 3rd was just approved to go up to 19stories which will effective block the view in that direction for 2/3 of the units! or harbor heights…where they just propped up a large low income housing building for chronically homeless/drug addicted right in front of it on 1st avenue! same with the buildings downtown like olive 8 – other planned construction is going to impact environment and views.